The Empire Avenue reconstruction and I-5 widening through Burbank includes the construction of 2 high occupancy vehicle (HOV) lanes, one lane in each direction. 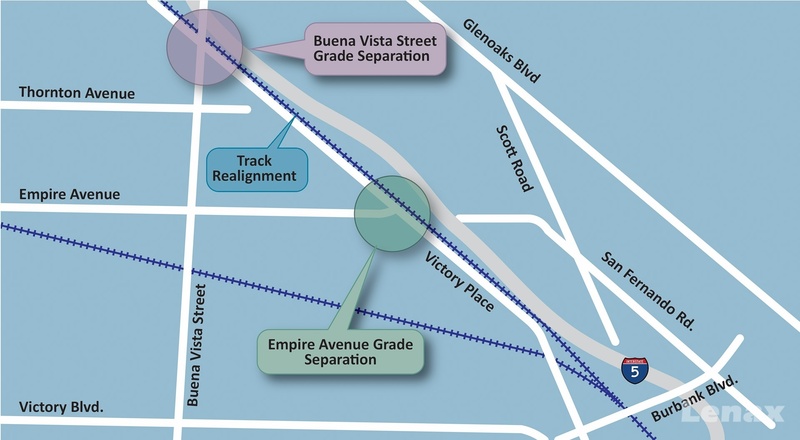 The freeway reconstruction involves substantial modifications to existing interchanges, adjacent railroad tracks and existing grade separations. 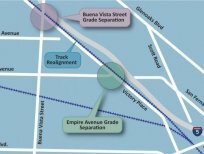 Metrolink's Empire Avenue Grade Separation project also involves realignment and elevation of the existing Metrolink track and siding, and construction of new grade separations at Empire Avenue and Buena Vista Street. To accomplish this, a temporary prefabricated railroad bridge has been installed in order for the work to be completed and to facilitate continued railroad usage. Also, the existing underpass at San Fernando Road will be abandoned, infilled, graded, and landscaped. Construction of 2 HOV lanes in both directions on the I-5. Place 300,000 cubic yards of infill and construct new elevated embankment with retaining walls to separate the new track alignment from the at-grade roadway. Construction of two new railroad bridges - one over the proposed Empire Avenue extension, and another at Buena Vista Street. Construction and eventual removal of a temporary shoofly to divert train traffic during construction of new permanent mainline, which involved installation of temporary traffic controls. Construction and eventual removal of a temporary prefab railroad bridge and track above San Fernando Road. Removal and reconstruction of 13,500 feet of Metrolink mainline track on elevated embankment. Removal and reconstruction of 11,000 feet of Brighton siding track on elevated embankment. Construction of abutment and piers for a future Metro Light Rail Transit track at Buena Vista Street.